The queue is now called “my list” in netflix. Why would netflix change that term? 2. a file or line, especially of people waiting their turn. As mentioned in reason 1, the first definition of queue is a hair braid. Who knew! Isn’t that a ponytail? Although when would you ever need to spell queue on their service? All of these don’t have enough search volume to show up on Google Trends. Doing a Google search for: netflix queue to my list, it seems apparent that this change happened on August 21, 2013. Please excuse me for taking four months to realize this. I bet you it’s your number 1 reason. People don’t know what a queue is. But I want to throw a curve-ball here. In radio, queue is spelled “cue”. Oooh. In radio, it’s a “cue.” Hmm. I wonder why radio doesn’t use “queue.” Perhaps in radio, cue is meant more as a verb instead of a noun. 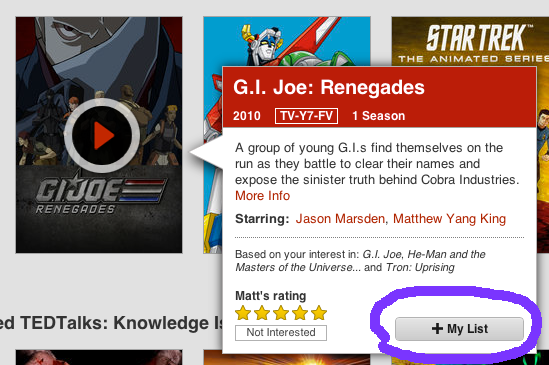 With netflix, queue is a noun–or I should say, was a noun (since they no longer use queue). Looking up “cue” on dictionary.com, it lists the nouns first. Hmm. Merriam Webster also lists the nouns definitions as the first two, the verb being third.